Yesterday I had some free time, so I decided to do some baking experimentation in the Quest Kitchen. Naturally all experiment roads are paved with chocolate so chocolate cupcakes came to mind. Cupcakes are the perfect decadent treat. They’re small so portion control is automatically in place. You can make them in small batches too so that you don’t have lots of cupcake friends around to scream your name. Cupcakes themselves aren’t the calorie bombs that people make them out to be either. Often they’re better in that respect than the innocent sounding muffin. It’s the frostings, fillings, and toppings that can get you with the cupcakes. Keeping that in mind, it’s easy to control by choosing your cupcake toppers wisely. I sometimes just do a dusting of powdered sugar, and other times like yesterday I get fancier and drizzle on a little frosting for flavor. It doesn’t take much to bump up the fun, and you get to enjoy the cupcake without completely unraveling your diet plans. To add a bit of unexpected flavor to these babies and keep the sugar lower, I used sugar free raspberry preserves in place of some of the sugar. The fruitiness wasn’t overwhelming and I really liked the dark chocolate raspberry combo. Preheat your oven to 350 degrees and line a cupcake tin with liners. I use the foil liners because I hate when my cupcakes stick to the paper liners. I don’t want to lose half my cupcake from sticking! Measure the dry ingredients into a bowl. Add the wet ingredients and mix well, either by hand or using an electric mixer. I’m old school and I just beat it by hand until the lumps are gone. Fill each liner about 2/3rds full. I got 9 cupcakes but it depends on the size of your cupcake tin. Bake at 350 degrees for 20 minutes. Remove from oven and cool before frosting. 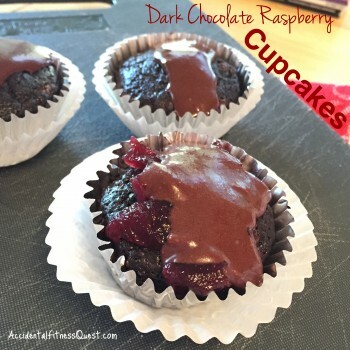 Makes 9 cupcakes at approximately 108 calories each – 2g protein, 16g carbs, and 4g fat. Regular milk or other non-dairy milk also works well here, but I was making these to enjoy with The Kid so I had to go dairy free due to her allergy. You could also use vegetable oil or canola oil instead of the coconut oil. I just grabbed what was at the front of the pantry. Yeah, that’s how I roll in my experiments. I spread my cupcakes with a thin layer of sugar free raspberry preserves and a drizzle of chocolate frosting. The frosting was simply cocoa, powdered sugar, dairy free butter, and water. That added another 50 calories to the total which still isn’t bad for a cupcake. You could even go crazy and use more frosting or sprinkles and other fun stuff.